C. Vibius C.f.C.n. Pansa Caetronianus. 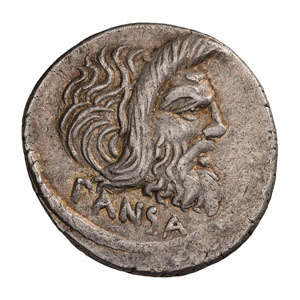 Denarius, 3.86gg. (4h). Rome, 48 BC. Obv: Mask of bearded Pan right, PANSA behind. 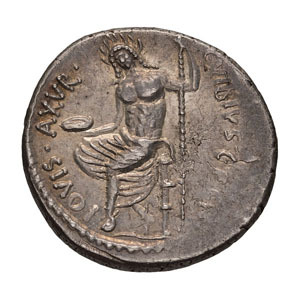 Rx: Jupiter Axurus seated left, with head laureate and almost facing, holding patera and scepter; IOVIS.AXVR before, C. VIBIVS C.F.C.N behind. Crawford 449/1a. Sydenham 947. RSC Vibia 18. Sear, Imperators 20. EF; minor area of weak strike.